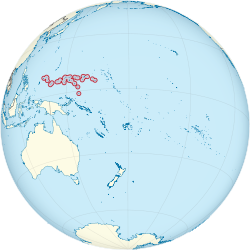 The Federated States of Micronesia ( /ˌmaɪkroʊˈniːʒə/ ( listen ); abbreviated FSM and also known simply as Micronesia) is an independent republic associated to the United States. It consists of four states – from west to east, Yap, Chuuk, Pohnpei and Kosrae –that are spread across the Western Pacific Ocean. Together, the states comprise around 607 islands (a combined land area of approximately 702 km2 or 271 sq mi) that cover a longitudinal distance of almost 2,700 km (1,678 mi) just north of the equator. They lie northeast of New Guinea, south of Guam and the Marianas, west of Nauru and the Marshall Islands, east of Palau and the Philippines, about 2,900 km (1,802 mi) north of eastern Australia and some 4,000 km (2,485 mi) southwest of the main islands of Hawaii. An associated state is the minor partner in a formal, free relationship between a political territory with a degree of statehood and a nation, for which no other specific term, such as protectorate, is adopted. The details of such free association are contained in United Nations General Assembly resolution 1541 (XV) Principle VI, a Compact of Free Association or Associated Statehood Act and are specific to the countries involved. 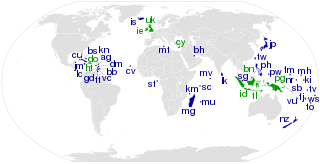 In the case of the Cook Islands and Niue, the details of their free association arrangement are contained in several documents, such as their respective constitutions, the 1983 Exchange of Letters between the governments of New Zealand and the Cook Islands, and the 2001 Joint Centenary Declaration. 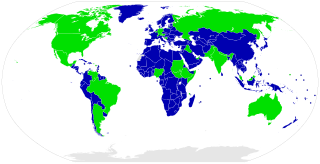 Free associated states can be described as independent or not, but free association is not a qualification of an entity's statehood or status as a subject of international law. While the FSM's total land area is quite small, it occupies more than 2,600,000 km2 (1,000,000 sq mi) of the Pacific Ocean, giving the country the 14th largest Exclusive Economic Zone in the world. The sovereign island nation's capital is Palikir, located on Pohnpei Island, while the largest city is Weno, located in the Chuuk Atoll. 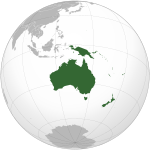 The South Pacific Mandate was a League of Nations mandate given to the Empire of Japan by the League of Nations following World War I. The South Pacific Mandate consisted of islands in the north Pacific Ocean that had been part of German New Guinea within the German colonial empire until they were occupied by Japan during World War I. Japan governed the islands under the mandate as part of the Japanese colonial empire until World War II, when the United States captured the islands. 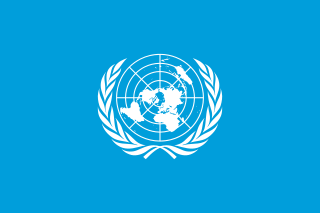 The islands then became the United Nations-established Trust Territory of the Pacific Islands governed by the United States. The islands are now part of Palau, Northern Mariana Islands, Federated States of Micronesia, and Marshall Islands. The FSM is a sovereign, self-governing state in free association with the United States of America, which is wholly responsible for its defense. The Division of Maritime Surveillance operates a paramilitary Maritime Wing and a small Maritime Police Unit. The Compact of Free Association allows FSM citizens to join the U.S. military without having to obtain U.S. permanent residency or citizenship,  allows for immigration and employment for Micronesians in the U.S., and establishes economic and technical aid programs. Successive Spanish governments have not abandoned Spain's sovereignty, or insisted on enforcing it, or recognized the sovereignty of the Federated States of Micronesia over Kapingamarangi. The Federated States of Micronesia claims sovereignty and has de facto control of the island. Pohnpei is home to Nan Madol: Ceremonial Centre of Eastern Micronesia, a UNESCO World Heritage Site, but the site is currently listed as In Danger due to natural causes. The government is working on the conservation of the site. 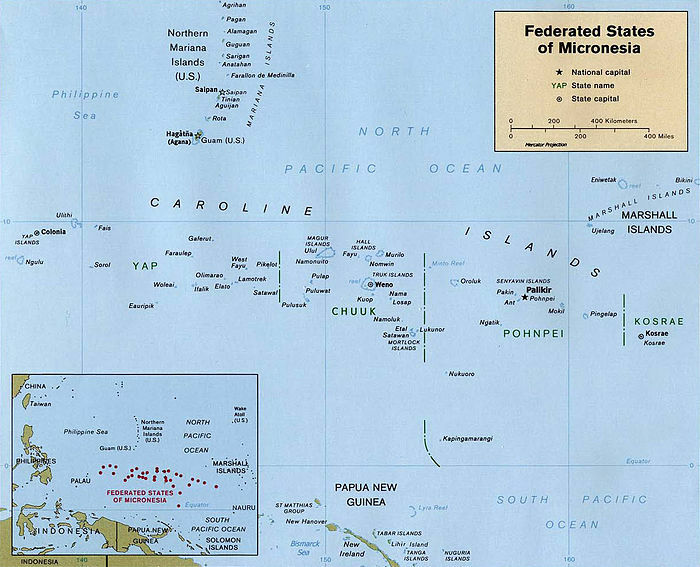 The Federated States of Micronesia are located on the Caroline Islands in the western Pacific Ocean. The history of the modern Federated States of Micronesia is one of settlement by Micronesians; colonization by Spain, Germany, and Japan; United Nations trusteeship under United States-administered Trust Territory of the Pacific Islands; and gradual independence beginning with the ratification of a sovereign constitution in 1979. 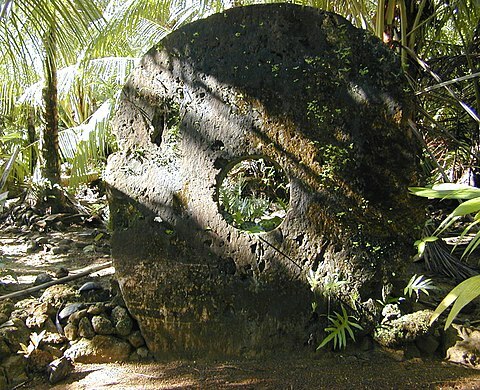 Pohnpei "upon (pohn) a stone altar (pei)" is an island of the Senyavin Islands which are part of the larger Caroline Islands group. It belongs to Pohnpei State, one of the four states in the Federated States of Micronesia (FSM). 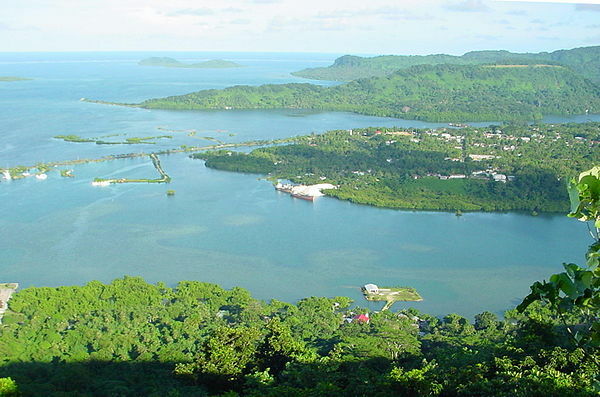 Major population centers on Pohnpei include Palikir, the FSM's capital, and Kolonia, the capital of Pohnpei State. Pohnpei Island is the largest (334 km²), with a highest point, most populous, and most developed single island in the FSM. Pohnpei State is one of the four states of the Federated States of Micronesia (FSM). The other states are, from the east to west, Kosrae State, Chuuk State, and Yap State. The state's principal island is Pohnpei. The Federated States of Micronesia Football Association or FSMFA is the governing body of football (soccer) in the Federated States of Micronesia, and of the national team. They are not an associate member of FIFA. Defense of the Federated States of Micronesia is the responsibility of the United States, but local police matters are handled by the FSM National Police, a small federal national police force, a division of the Department of Justice. 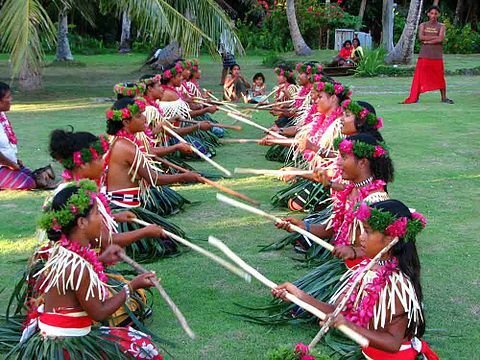 Micronesian Americans are Americans who are descended from people of the Federated States of Micronesia. According to the 2010 census, a total of 8,185 residents self-identified as having origins in the country, which consists of four states. More than half of these residents identified their origin as Chuuk State (4,211) with the rest as follows: 2,060 people from Pohnpei, 1,018 from Yap, and 906 people from Kosrae. This is a survey of the postage stamps and postal history of the Federated States of Micronesia (FSM). The Federated States of Micronesia Athletic Association (FSMAA) is the governing body for the sport of athletics in the Federated States of Micronesia (FSM). The 8th Micronesian Games were held from July 20 to July 30, 2014, in Pohnpei, Federated States of Micronesia (FSM). ↑ Summary Analysis of Key Indicators: from the FSM 2010 Census of Population and Housing (PDF). Palikir: Division of Statistics, Office of SBOC. p. 8. Retrieved 16 March 2018– via Prism (SPC). ↑ Kehoe, Monika. "Language of Micronesia and Guam" (PDF). Archived (PDF) from the original on February 9, 2017. ↑ "Drops in the ocean: France's marine territories". ↑ General Assembly - Overall Votes - Comparison with U.S. vote Archived June 26, 2017, at the Wayback Machine lists Micronesia as in the country with the fourth high coincidence of votes. Micronesia has always been in the top four. ↑ "U.S. Military Enlistment Standards" (PDF). Archived from the original (PDF) on 2008-10-01. 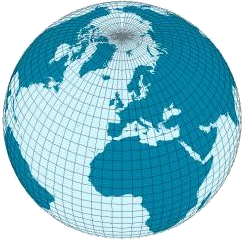 1 2 3 4 "The World Factbook -- Central Intelligence Agency". Cia World Factbook. Archived from the original on 7 August 2018. Retrieved 8 August 2018. ↑ "FSM Population". www.fsmgov.org. Archived from the original on June 29, 2012. Retrieved January 22, 2017. ↑ "Federated States Of Micronesia (FSM) Division of Civil Aviation l Pohnpei International Airport (PNI) (PTPN), Pohnpei Island, Micronesia". Federated States of Micronesia Division of Civil Aviation. 7 August 2018. Archived from the original on 8 August 2018. Retrieved 7 August 2018. ↑ "Federated States of Micronesia (FSM) Division of Civil Aviation l Chuuk International Airport (TKK) (PTKK) Weno Island, Micronesia". Federated States of Micronesia Division of Civil Aviation. 7 August 2018. Archived from the original on 8 August 2018. Retrieved 7 August 2018. ↑ "Federated States of Micronesia (FSM) Division of Civil Aviation l Kosrae International Airport (KSA) (PTSA), Kosrae Island, Micronesia". 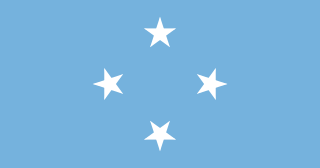 Federated States of Micronesia Division of Civil Aviation. 7 August 2018. Archived from the original on 8 August 2018. Retrieved 7 August 2018. ↑ "Federated States of Micronesia (FSM) Division of Civil Aviation l Yap International Airport (YAP) (PTYA), Wa'ab, Micronesia". Federated States of Micronesia Department of Civil Aviation. 7 August 2018. Archived from the original on 8 August 2018. Retrieved 7 August 2018. ↑ "US Relations with the Federated States of Micronesia". United States Department of State. ↑ "Micronesia". Ethnologue. Retrieved 2019-02-01. 1 2 3 4 5 6 7 8 9 10 11 12 13 14 15 International Religious Freedom Report 2007: Micronesia, Federated States of Archived January 13, 2012, at the Wayback Machine . United States Bureau of Democracy, Human Rights and Labor (September 14, 2007). This article incorporates text from this source, which is in the public domain. Parfit, Michael (2003). "Islands of the Pacific". National Geographic . 203 (March 2003): 106–125. "Federated States of Micronesia". The World Factbook . Central Intelligence Agency.